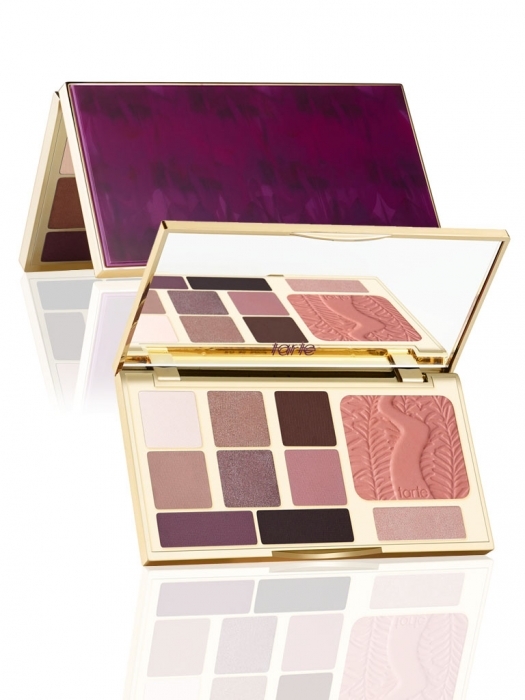 Glam Up With Tarte’s EnergyNoir Collection This Fall! Tarte’s new EnergyNoir collection is gorgeous for Fall makeup looks! I love tarte’s blend of natural ingredients and glamorous products. I am reviewing the EnergyNoir products, new colors of matte LipSurgence and the sculptor for face contouring. Tarte limited-edition energy noir clay palette ($38 USD) — Feel the energy of the night with tarte’s clay-infused eye & cheek palette featuring eight stunning shadows in a mix of neutral, plum and smokey shades. Then, you can charge up your look with the versatile eye & cheek highlighter and warm neutral blush, each infused with tarte’s iconic Amazonian clay and encased in a sleek, statement palette. tarte LipSurgence skintuitive lip tint in energy noir ($24 USD) — Invigorate your lip wardrobe and create a custom noir pout with the latest shade to join tarte’s best-selling skintuitive™ lip tint. This new noir extension of tarte’s custom energy family features the skintuitive™ pH-adjusting technology which instantly responds to lips’ natural energy to deliver a custom shade of berry that’s unique to each tartelette. With the 3-in-1 benefits of a lipstick, lip gloss and a moisture-rich balm, the ultra-hydrating and lightweight formula pairs perfectly with the new LipSurgence™ skintuitive lip gloss in energy noir for a coordinating, glossy finish and a sultry burst of deep berry energy. tarte LipSurgence skintuitive lip gloss in energy noir ($19 USD) — Channel your unique “energy noir” with the newest skintuitive shade to join tarte’s energy family for a mega-watt pout in your own custom pop of sheer berry. Powered by tarte’s proprietary skintuitive™ technology, the high-performance formula responds to lips’ natural energy and pH to deliver an exclusive berry shade that’s all your own. Like a drink of water for your lips, the hydrating, antioxidant-infused formula helps smooth the appearance of fine lines and wrinkles while it wraps lips in moisture, shine and a sheer berry hue that pairs perfectly with the coordinating LipSurgence™ lip tint in energy noir. tarte LipSurgence matte lip tint ($24 USD) — Meet your perfect matte – tarte’s award-winning, 3-in-1 lip tint offers the pigmented performance of a lipstick combined with the creamy moisture of a gloss and a rich balm. Infused with skinvigorating™ ingredients like vitamins C & E, this nourishing formula moisturizes and smooths the appearance of lips while delivering natural-looking color with a soft matte finish. Simply twist up the automatic pencil tip and glide it over lips to deliver the ultimate in fashion-matte perfection. The new shades are bare (marsala) and tempted (dark berry). tarte the sculptor contouring face slenderizer ($24 USD) — Chisel your cheekbones in seconds with the sculptor contouring face slenderizer, an innovative contouring tool which helps create the illusion of a slimmer, more defined face. The stick applicator comes in tarte’s signature park ave princess shade designed to complement all skin tones. Create instant definition and the look of high cheekbones with this easy-to-use tool, while creating a naturally slimmer appearance on the neck, jawline and nose. Available in three shades, the shade above is Park Avenue Princess 2, the medium shade. What I think: The gorgeous plums and neutrals of the palette work perfectly with the berry EnergyNoir lip colors — which are my favorite items in the collection. I usually wear lighter colors on my lips, but these are so sheer and they remind me of Fall. I will definitely be wearing this collection over the next few months. I am not much of a matte lip wearer, because they can feel dry on your lips. the matte LipSurgence leaves some moisture on the lip, which is needed during cooler weather. I like bare the most, because it is a great neutral, but tempted is nice with the EnergyNoir lip color over I. It makes a very pretty combo! One of the most used products for me is the sculptor. The pencil is so creamy the you can draw lines all over the face and it blend seamlessly! My jaw and child benefit immensely from this pencil! I also contour my cheeks and the sides of my nose. All of these amazing products are available at http://www.tartecosmetics.com. Please leave a comment and let me know if you have purchased or plan to purchase any of these items.